The Académie des Beaux-Arts in Paris, founded in the early 17th century, became the training ground and the standard for fine art in Europe. 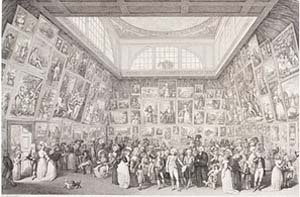 Starting in the 18th century its graduates showed their work in an official exhibit, called the Salon. The Salon was a celebrated, standard-setting event and it was huge. The paintings covered the walls from floor to ceiling. When you hang works one above the other, that’s called the Salon style. That sounds elegant, but the effect is what we would now call cluttered. Clutter was not a problem for the Victorians and certainly not for the 18th and 17th century. For our venerable ancestors, it was all about more is better. Restraint and understatement come with Modernism. That’s because the modern sensibility wants an experience. Well, you might ask, what else would anyone want? We take it for granted that art is about experience. But ‘twas not ever thus, apparently. People used to go to public events because it was the thing to do—a social and civic exercise–not because they expected a transforming experience. We moderns go in search of an experience. Therefore, we want to see one painting at a time, at eye level, thank you, so that we can have a one-on-one. We want to look up close at the brush strokes, step back for a different take, immerse ourselves, introspect, observe our reaction, register surprise or delight, grab a little aesthetic experience. One at a time is called the Gallery Style. The Wilmette Library Show is hung Salon Style. When you go to see it you’re not wearing a top hat or a bustle, because you’re a Modern and so the show looks cluttered. The experience you go in search of does not happen. 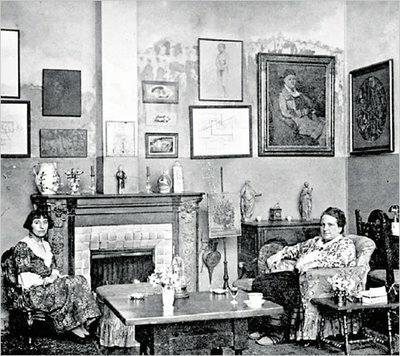 Gertrude Stein hoarded works by Picasso and Matisse in the early decades of the 20th century and she hung her collection Salon Style. She was a quintessential Modern, but she was also a hoarder who lived in a Parisian apartment with limited closet space. What to do? Can’t stop collecting. Go Salon Style.